On Friday, Feb. 8, Ariana Grande gave her fans several gifts — her new album Thank U, Next dropped, along with the Grande's video for "Break Up With Your Girlfriend, I'm Bored" her new single. The song's video is a sultry, moody look at a love triangle between Grande, a man (played by Riverdale actor Charles Melton), and another woman (played by model Ariel Yasmine). 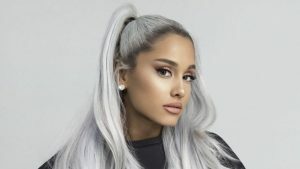 The video was directed by Hannah Lux Davis, who was also at the helm for Grande's videos for "Thank U, Next," and "7 Rings." The visuals for "Break Up With Your Girlfriend, I'm Bored" feature Grande sporting her blonde hair at a party and watching Metlon and Yasmine dance. Grande and Melton's eyes meet from across the room, but then Yasmine invites Grande to join the couple on the dance floor. The trio dance together, but then when they go to the bar to get drinks, Grande stares at couple with envy. She even strokes Yasmine's brunette hair... and at another roof top party, Grande sports a similar hair color. Coincidence? Probably not.